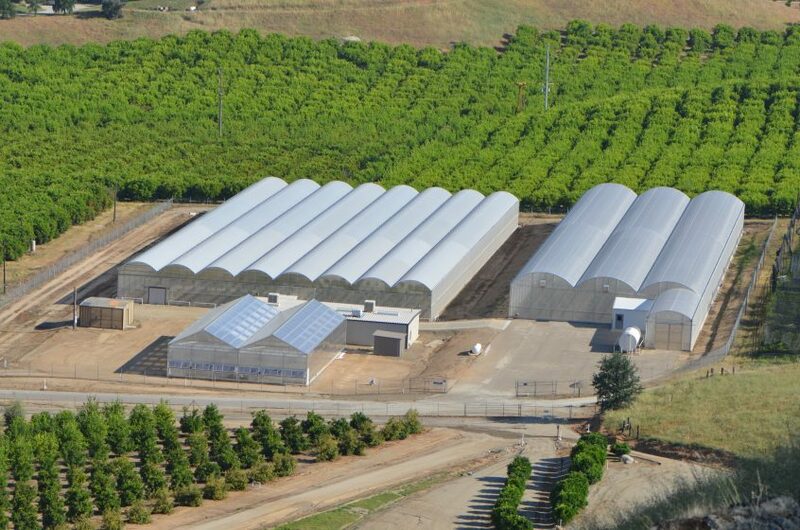 Three old trees at the Lindcove Research and Extension Center (REC) might hold the key to huanglongbing (HLB) resistance, according to an article in the University of California (UC) publication California Agriculture. The Lindcove REC is located on the eastern edge of the San Joaquin Valley near Visalia, California. Mikeal Roose, professor of genetics at UC Riverside. Photo courtesy California Agriculture January-March 2017. 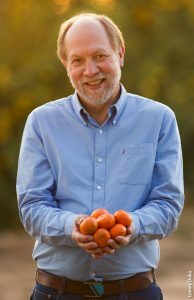 Several of the citrus varieties tested at Lindcove REC were bred by Mikeal Roose, professor of genetics in the Department of Botany and Plant Sciences at UC Riverside. Three trees with inedible fruit have his attention now. They are 34-year-old trees, crosses of sweet orange (two) and Rangpur lime (one) with Eremocitrus glauca, the desert lime, a wild Australian citrus relative. Roose believes they might lead to a citrus variety resistant to HLB disease. HLB has been found in residential citrus trees in Southern California, but hasn’t reached California’s commercial orchards yet. Lindcove REC Director Elizabeth Grafton-Cardwell expects the disease will arrive within four or five years. The Lindcove REC, California’s main center for citrus field research and Extension, is a staging ground, she says, for dealing with it. Researchers from around the state are conducting research at Lindcove REC related to the Asian citrus psyllid and HLB problem. Studies of the best use of systemic neonicotinoid insecticide applications to protect new growth, preferred by psyllids for feeding and reproduction, are underway by UC Riverside scientist Frank Byrne. Professor Cristina Davis’s research group at UC Davis has tested the use of a gas chromatograph at Lindcove REC to describe the profile of volatile organic compounds emitted by sick and healthy trees. At the Lindcove REC, it was used to differentiate between trees infected with citrus tristeza virus and healthy trees. In Florida, the equipment shows promise for early detection of HLB infection. Ground at the Lindcove REC is being prepared for two new studies. The Citrus Clonal Protection Program has received industry and federal funding to introduce at least 50 citrus varieties that seem to be surviving the HLB epidemic in Florida research breeding blocks. These will be evaluated for their horticultural characteristics at Lindcove REC and used by Roose and other scientists. The accessions include rootstocks, mandarins, sweet oranges, grapefruit and pummelos.